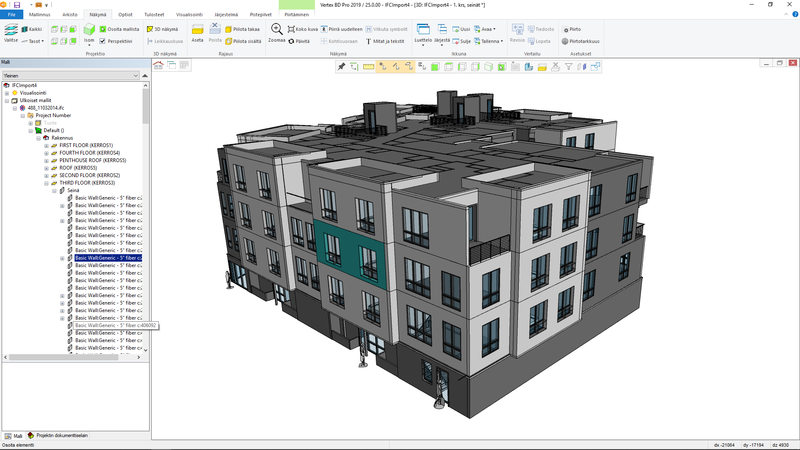 IFC is an open file format to share data between CAD software applications and allows you to import 3D models created with other architectural CAD systems into Vertex BD. IFC is especially useful when Vertex BD is used for panel detailing and architectural design was done in other CAD software. Typically, there are multiple change orders during a construction project. The longer the drafting process is, more changes you have to go through during the project. By using Vertex BD's new IFC conversion tools, you can complete projects faster by skipping the trace-over and re-modeling phases in the process. Imported IFC models are now under the External models branch in the model tree. Now, it's easy to see and manage imported IFC objects in the model tree. You can hide objects. You can easily select same type of objects of one floor. Vertex BD native objects that are converted from IFC objects are shown together with all other native building parts in 3D view as before. Earlier, we had two different methods for importing objects. One was automatic conversion, and the other reference model import. Now, an IFC model is imported as a new type of reference model by default. You have direct access to imported IFC objects. You can hide and unhide them and convert them to BD objects, if needed. You can now easily replace an imported IFC file with a new version. When you update an existing IFC model with a newer one, you can see changed, added and missing parts. The last selected IFC export settings are the default next time you export a building to the IFC format. You can now use the building origin or the site origin when exporting a model to IFC. The origin of a project might be outside of the building. Now, it is possible to add a site origin to the building. If the site origin exists, it can be used as the origin point when exporting the model to IFC. There are two export options for the site origin: use Project North (coordinate system direction is the same as in the building origin) or use True North. If you select the True North direction, Y-axis is rotated to be parallel to the True North direction in the IFC export. Use selection buttons to select quickly between architectural and framing models when writing IFC file. You can now also write sub projects to IFC. It is possible to import another project as a sub project (earlier we used the term flat) to the active project. Now, a sub project can also be written to the IFC file when the project is exported. CLT sheets can be written to the IFC file in IFC export. Panels that do not contain any parts are now written to the IFC file. Earlier panels were written only, if there were parts connected to them. Sometimes it is necessary to write only panel shapes, for example to checking purposes when panel is made from solid material and it doesn't contain other than solid material layers. Standard shapes Rectangle, I, C, U, RHS and CHS profiles are now written to IFC using specific format for each shape. This makes utilizing of the IFC easier when importing it to another software. It is necessary to keep the imported IFC model as it is. Common functions are disabled to prevent the user to change imported IFC objects by accident. It is still possible to move imported IFC objects. In some cases, it is necessary to move the entire building, for example when the origin point is in wrong location.